With the Points history module, you can show customers the changes in their point balance over time. By enabling this module, the history page will be added to the customer’s Loyalty Hub. The page contains a list of all customer actions that have resulted in point acquisition or reduction. 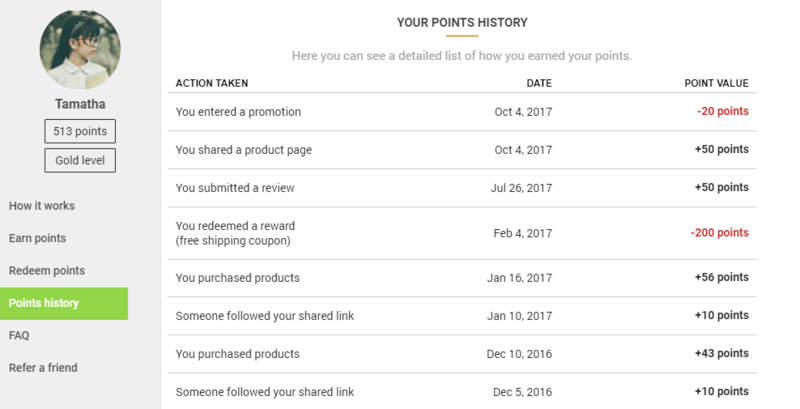 This way, customers can clearly see when and how they’ve earned, lost or spent their points. After the module is enabled, you can find the design editor of the history page by clicking on the ‘Settings’ link in the top menu bar, then selecting the ‘Design’ tab from the list on the left-hand side.